Two events down and already, two international winners have come to the fore in the early stages of the ALPG’s 2016 season. 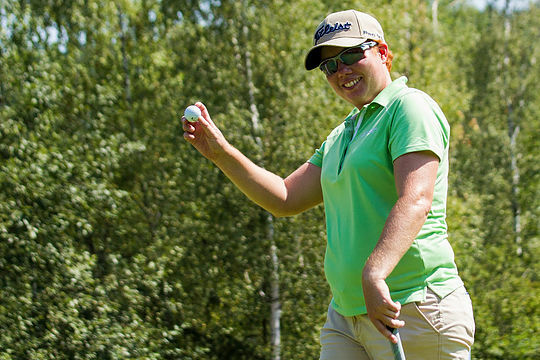 England’s Felicity Johnson shot a 2nd round 67 on Sunday to claim her 3rd career victory at the Mt Broughton Ladies Classic in the NSW Southern Highlands. Johnson started the final round at 7-under after a course record equalling 65 in the first round, a shot ahead of Sydney’s Lauren Hibbert. Both players had fast starts with eagles on the 3rd hole in the final round but it was the seasoned Johnson who ultimately shone through with an impressive 5-under 67 for a comfortable five stroke win. “It feels great to be back in the winner’s circle, I couldn’t have asked for a better start to 2016. I have worked really hard earlier in the year with my coach in the U.S. Tony Ziegler and it shows that we are working on the right things,” Johnson said. Hibbert’s second place was her career best finish on the ALPG tour, while Sarah Oh finished alone in third place at 5-under. Earlier, Brazil’s Miriam Nagl took out the Moss Vale Ladies Classic with a par on the 3rd playoff hole, defeating Mexico’s Ana Menendez after the pair had finished the 36 hole event at 6-under par. Nagl shot at 4-under 69 to add to her opening round 71, and faced an anxious wait in the clubhouse until Menendez, signed for a 2-under 71 to match Nagl’s score. The tour resumes on Thursday at the Oatlands Golf CLub for the Bing Lee Fujitsu ALPG Ladies Classic from 14-15 January, followed by the Mulpha Norwest Ladies Pro-Am at Castle Hill Golf and Country Club on January 19.